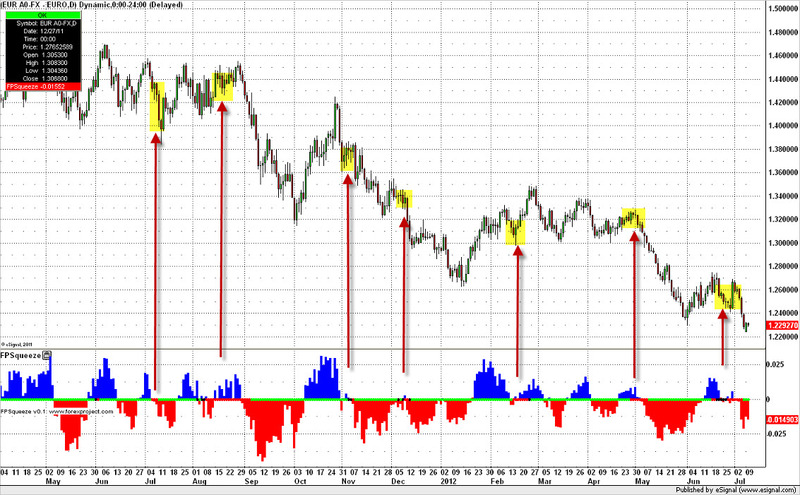 The Squeeze Indicator measures market volatility and momentum and works across multiple markets and time frames. Markets spend a lot of time trading in ranges, building up energy for the next large move higher or lower. Volatility in the markets is cyclical: by paying attention to which phase of the cycle we are in, we can adapt our trading style to the current market condition. A squeeze is generated during quiet periods in the market when the Bollinger Bands move inside the Keltner Channels and indicated by horizontal red dots inside the squeeze histogram (please see euro charts below). While the Bollinger Bands remain inside the Keltner Channels market volatility remains contracted. Once market volatility starts to expand, the Bollinger Bands move back outside the Keltner Channels and the squeeze will fire off either long or short: at this point the squeeze indicator changes from red to green dots. Direction out of the squeeze is important. Market momentum is shown on the squeeze indicator through the momentum index oscillator (blue = upside momentum, red = downside momentum). If momentum is above the 0 line when the squeeze triggers, then a long squeeze has fired off. If momentum is below the 0 line when the squeeze triggers, a short squeeze has fired off. Market highs and lows can also be bracketed while inside the squeeze to help determine the initial direction of the breakout move. Squeeze works best on the lower time frames such as daily, weekly and monthly bars, but can also be applied to higher time frames such as hourly and 30 minute bars. Generally the higher the time frame, the higher the number of false breakouts likely to be triggered by random market noise. Euro currency weekly Squeeze Indicator: Notice how large moves are often preceded by contracting volatility on the squeeze. 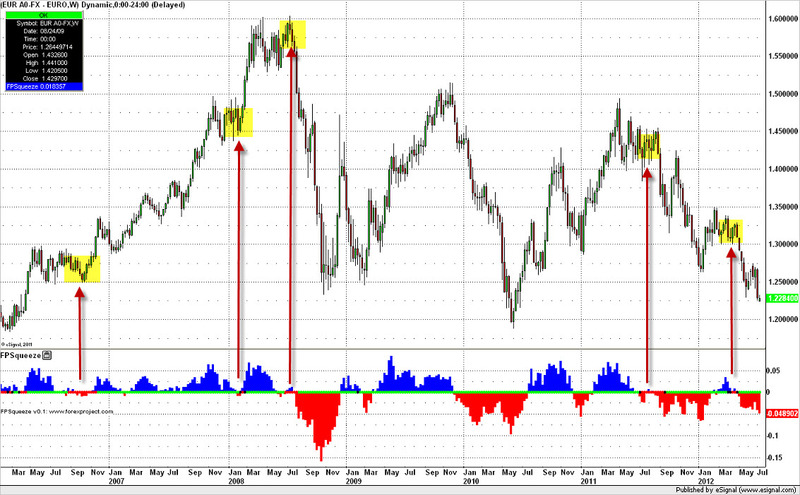 Once a squeeze has fired off long or short, it is important to monitor the slope on the momentum index oscillator. Momentum should be expanding in the direction of the breakout move. A decline in momentum after a breakout of the squeeze is a warning signal that the move may be coming to an end and can be used to lighten up / take off positions initiated earlier. Code for the Squeeze indicator is freely available on our downloads page at the following link: Squeeze Indicator Code. Parameters for the Squeeze indicator are as follows: 12-period momentum index oscillator, 20 and 1.5 for Keltner Channels and 20 and 2 for Bollinger Bands. The Squeeze Breakout Strategy plus many more robust strategies can be found at our Forex Trading Strategies page.